The Pirate Training Camp – A fun play area where kids can climb on board a wooden boat and let their imaginations run wild as they tackle rope nets and make up their own seafaring adventure. The Enchanted Forest – Enjoy a stroll through the beautiful nature reserve and see many woodland creatures in their natural environment. You can even bring along a picnic meal to enjoy. Pirate Goldwash – Pan for gold and exchange all the treasure you find for an impressive golden pirate medallion and look the part with a visit to the temporary tattooist. 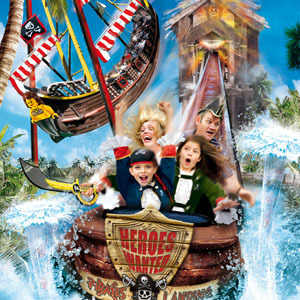 Rides – The Jolly Rocker, not for the light-hearted; and Pirate Falls Dynamite Drench, a water ride (duh!). So now when on holiday, the whole family can have a swashbuckling good time!